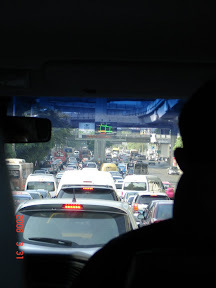 First, the cons: Bangkok traffic is the worst! That's about it. 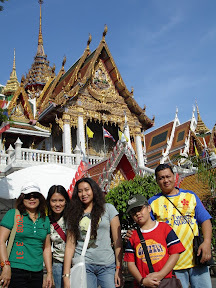 This is Wat Hua Lamphong, a "new" temple. 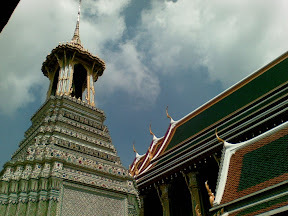 The wat (temple) houses Buddhist monks and the different positions of Buddha. It serves as a sneek peek to what lies ahead. 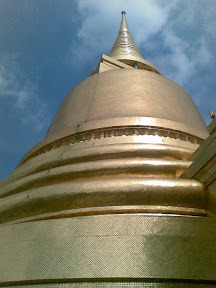 The Golden Buddha at Wat Traimit. It is magnificent! 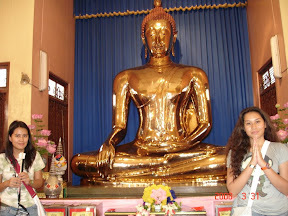 That statue is made of GOLD! 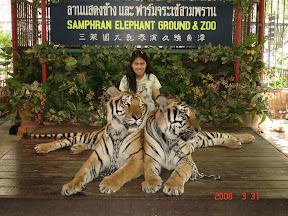 These are the tigers at Samphran Elephant Ground and Zoo. Yup,I touched them. Hehehehe. The Elephant Show! 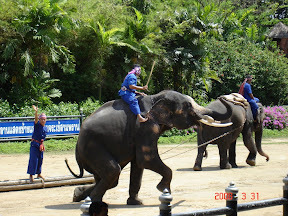 One of the spectacles in this zoo (and in Thailand). 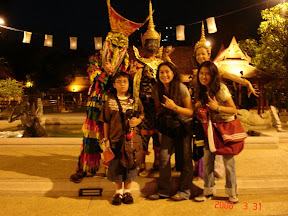 These elephants so cutely performed the history of Thailand. 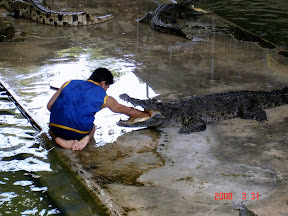 The Crocodile Wrestling was, well, swampy... I was too excited for the elephant ride to marvel at it. Sorry. 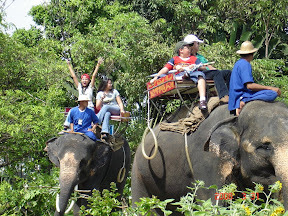 The Elephant Ride! Yup, drool on it!!! 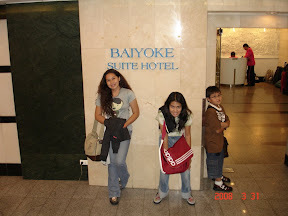 Baiyoke Suite Hotel, the hotel that served (fed) as well. Look, I'm being carried by an elephant! HOW COOL IS THAT! The Yellow Submarine! 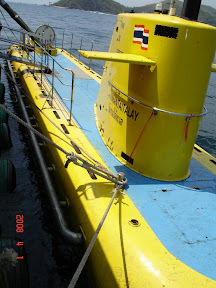 This is the only civil submarine in Asia - sp it is really a once-in-a-lifetime experience. 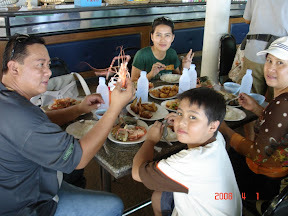 The submarine is located in Pattaya, a speedboat ride from Coral Island. This is the tour offered by the Yellow Submarine. 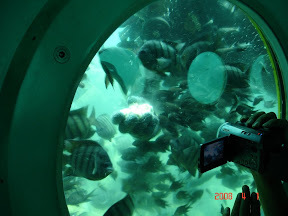 At 30,000 miles 30 meters below sea level, you can see the marine life right outside the window. That's the captain of the submarine (he's Korean), and his control room. Bangkok Skyline at night. Isn't it grand? 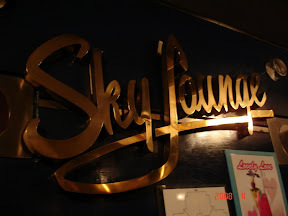 Sky Lounge, Baiyoke Suite Hotel's restaurant. 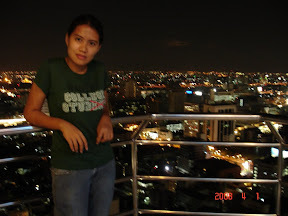 Nice Thai food, and nice view of Bangkok (at 43rd floor). Thai shopping where everything is cheap! We can't resist this. 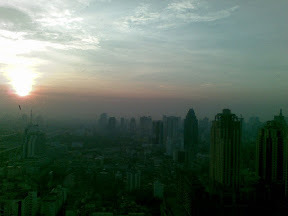 Bangkok sunrise to greet us for our last day in this great city. 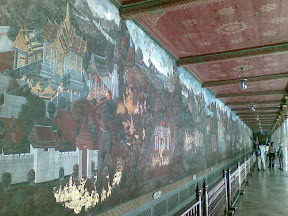 This is the Grand Palace mural, the longest in the world. P.S. This bell is made of solid gold! Drool over these magnificent monuments because these are made out of mosaic. 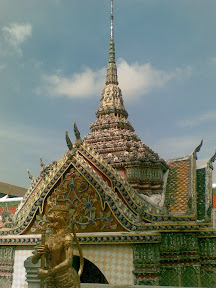 Can you imagine ALL OF THESE are made out of tiny pieces of details to build such structures? Whew! 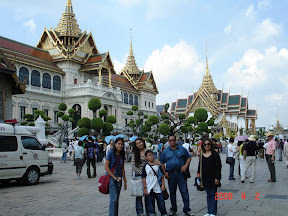 This is Wat Phra Kaew, The Temple of the Emerald Buddha. 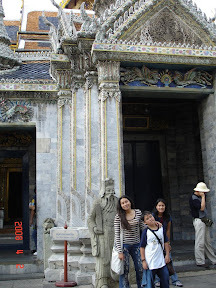 Cameras are not allowed inside, but I tell you, something that is made out of pure jade is BEAUTIFUL! This is where they crown their King. Again, no pictures of the interior. 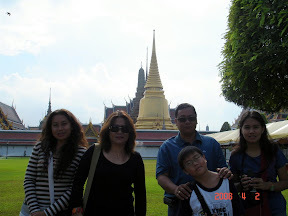 This is the Grand Palace Section 2. Can you believe there is a section 2 of this place? 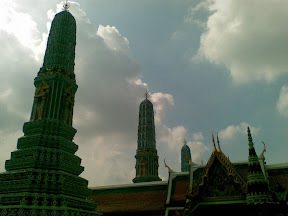 Anyway, note the European architecture mixed with Thai roofings. 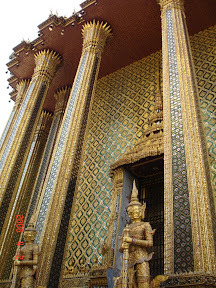 The King who would live there did not like it, so he has to build another palace three times as big as this place. Monks! 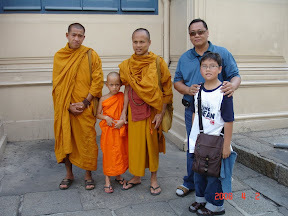 And Randy said the little monk is Aang (from Avatar: The Last Airbender series). 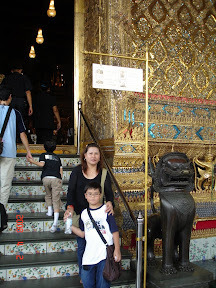 Behold The Reclining Buddha of Wat Pho. 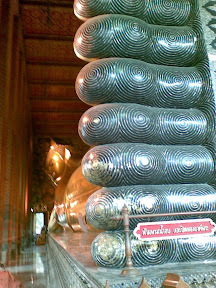 This is the 2nd largest reclining Buddha. Second??? 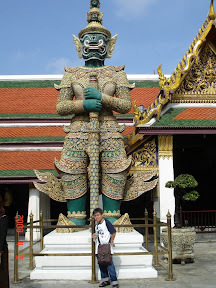 This statue is HUMONGOUS - how can there be anything bigger than this? 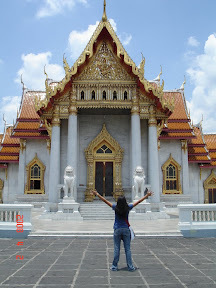 It's not Taj Mahal, but this is a Marble Temple - Wat Benchamabophit. We caught up a prayer session. Despite the magnificent size of their temples, their prayer rooms are relatively small. I would never know why. 2. 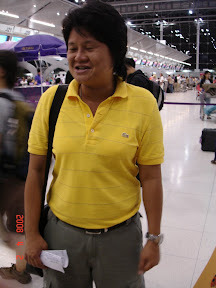 Thais are not really that good in English, so big communication gap there. 3. 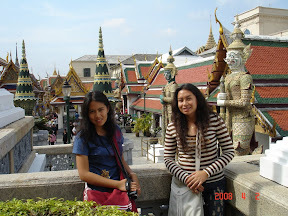 Thai + Buddhist culture is very different from ours (western and the westernized). get her because she does her job well. Thank you Loy (if you ever read this - hehehe). - They revere their King so much! Everywhere you see the picture of their King, and most people wear yellow (the color of the King). - Monday is their Sunday (if you get my gist). 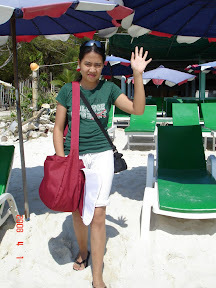 - Thailand is the right place to shop because their prices are cheap (you won't believe it!). And STOP - if you think the regular price is cheap - BARGAIN MORE because it would become even lower. - For me, it's best to walk in the streets (but beware of pickpockets, but I guess we are used to that) after the tour. 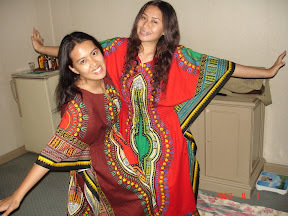 The best bargains you can get are with the street vendors (just like in Pinas!). 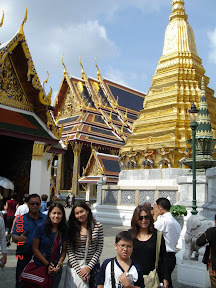 For us, we went to Indra. - Thailand is truly AMAZING! - more pictures at our family's website. 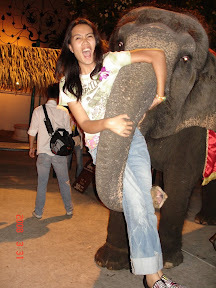 note: labon natry man ka og dare things with the elephant,d try unta sad nimo og butang imo kamot sa buwaya! 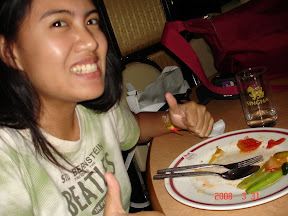 Dili pa ko ingana ka high-level Mans, hahaha! Ah, traffic... good to know dili pa diay grabe ang sa Cagayan. So pinka worse gyud ang sa Bangkok? hehehe. what about manila?